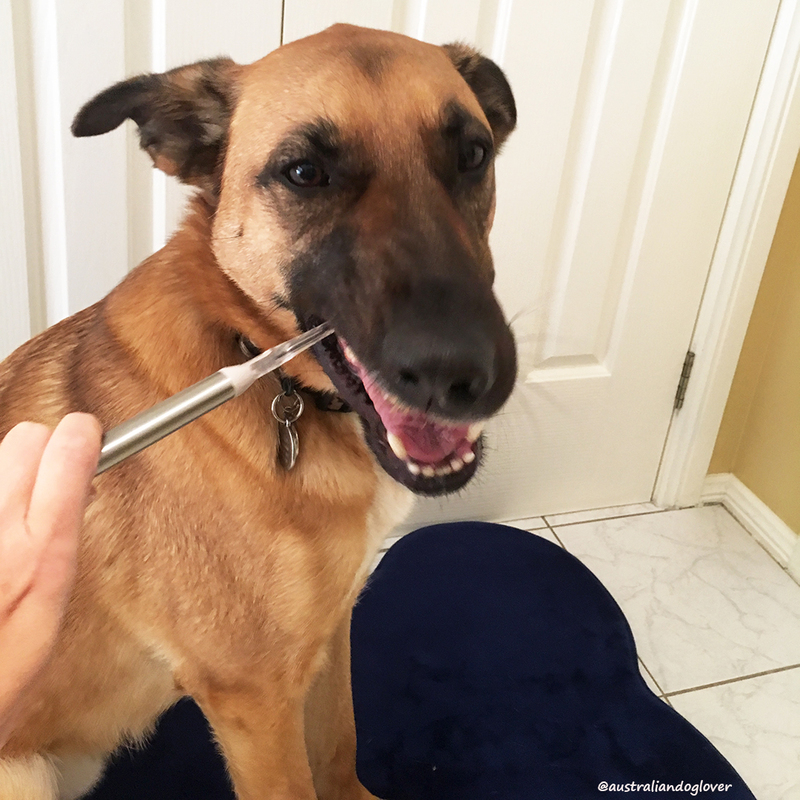 The Soladey ION5 is the world’s first titanium light-activated ionic toothbrush which promises to do a lot more than just brush your dog's teeth! The ION5 is designed in Canada, made in Japan and now distributed globally including in Australia. We first came across this product at the 2017 Melbourne Dog Lovers Show and August being Pet Dental Month, we decided to take a closer look at this toothbrush as it is now marketed towards not only humans but also pets (using different heads of course!). 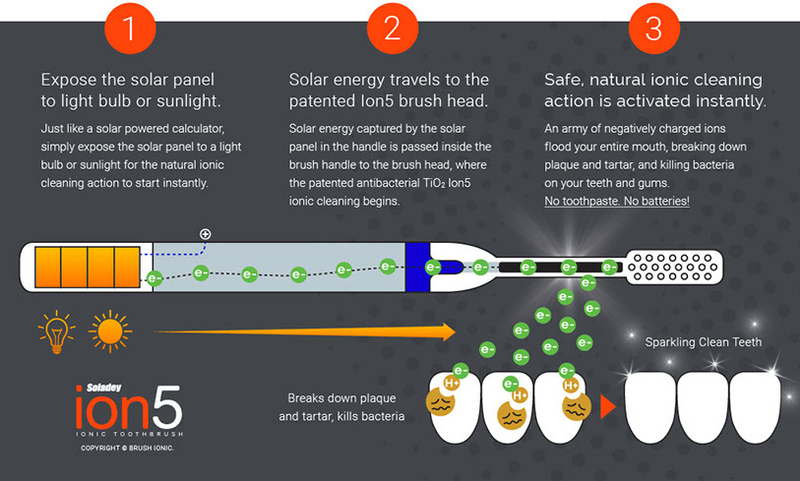 HOW DOES THE ION5 IONIC TOOTHBRUSH WORK? This ionic toothbrush contains a photosensitive titanium* dioxide rod. When exposed to any light source (sunlight, plain light bulb or fluorescent bathroom light), the solar panel charges the patented titanium dioxide semiconductor rod inside ION5 converting light into ions (negatively charged electrons). The rod then releases the ions, which blend with saliva to attract positive (hydrogen) ions from the acid in the dental plaque. The acid is then neutralised and plaque is disintegrated. NB: *Titanium is used in many medical applications worldwide and deemed safe. In simple terms, to use your brush you only need to wet the bristles and semiconductor with water and brush your teeth (lightly but thoroughly) as you would with an ordinary toothbrush for 2 to 3 minutes. When the toothbrush is working effectively , you will notice that your saliva will foam slightly. What you need to get your head around (we struggled with that one...) is that you don’t really need to use toothpaste though you can add a small amount if you wish. The essential requirement is that there is always an adequate light source hitting the solar panel for activation. WHAT ARE THE GENERAL BENEFITS OF USING THE ION5 TOOTHBRUSH? The manufacturer promotes a whole host of great benefits, ranging from a brighter smile, to reduced cavities and reduced plaque build-up and a fresher breath which you would expect from brushing your teeth regularly (3 minutes, twice daily). We can definitely see the advantages for travelling (camping trips, long flights etc.) as it works without toothpaste and even water: saliva is sufficient for use outdoors. There are potentially long-term savings as the handle and rod are built to last for years, requiring only inexpensive replaceable heads. The trick however consists in training our dogs early (from the puppy stage) with lots of rewards along the way to accept these simple grooming tasks like tooth brushing and nail trimming as normal and pleasant activities. 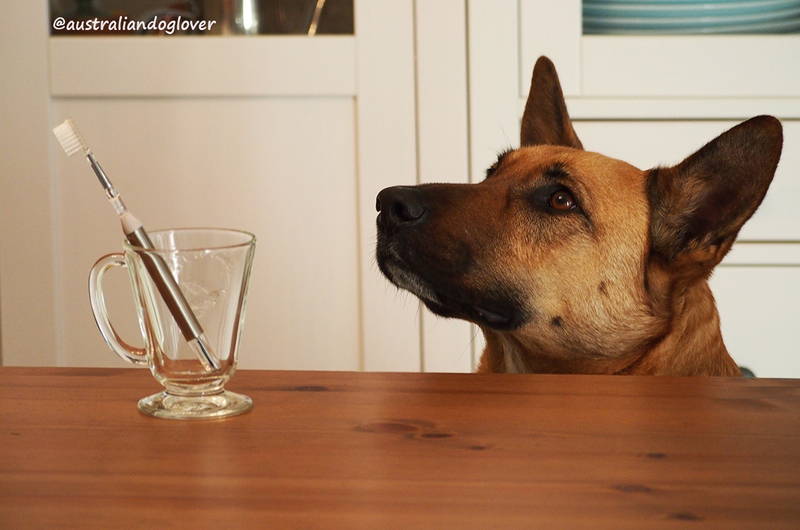 With an older dog, this may take a bit of getting used to so maybe set up a routine in a relaxing space (no noise or distractions) and start with introducing the ION5 toothbrush over time without forcing the issue. The manufacturer advises to start with a normal finger brush (available from most pet stores and vets) then move on to just the ION5 brush head and then the full brush. Progressively you should be able to massage closer to our dog’s mouth (watch out for any signs your dog is not comfortable or relaxed!) and eventually you will be able to massage around and inside the mouth without causing any distress. This could take months depending on your dog... However if the alternative is expensive dental cleaning under anaesthesia at the vet every few years, we definitely think it’s worth a try! Disclaimer: Product gifted by Sirius Dog Cares for editorial consideration.